Forget that cumbersome blocking board or random towels lying around the house. 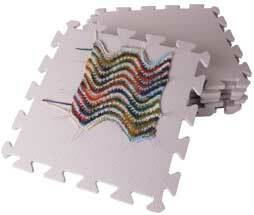 These foam rubber mats fit together like puzzle pieces to make the size and shape you need. It is an affordable and portable alternative to blocking boards. One side is smooth, one side is has texture. Contains nine 12.5" light purple squares, 3/8" thick . I love my blocking mats, but needed a second set for a large shawl I knit. I have had them for about 3 years. They work well, but I wish they had a 1" grid on them. It would make things so much easier. I got them during a sale, but probably would not have ordered them at full price. I got them specifically to layout and hold icords in place for stitching onto a sweater front. Now that I am nearly finished, I wish I had gotten a full 24” athletic mat for the job. The seams make the mats too flexible to hold securely on my lap while working. I also keep stabbing myself with pins because they go through the foam easily and the mats are only 1/2” thick. Giving 3 stars because I think they will work fine for blocking. They just aren’t great for the job I had in mind. I bought one set, which works well for small items like scarves or hats, but ended up needing a second set to handle stoles and large shawls. Unfortunately, the second set was cut so the corners are mirror images and do not interlock, unless the second set is used upside down, making for a different surface under part of the item being blocked. I am concerned that the upside-down set will not wear well when the force of the pins stretching lace is against the softer bottom rather than the harder top surface of the mats. It would be really nice if one set was big enough to block all pieces of a sweater - seems like a no-brainer. I can get twice as much square footage for the same price by buying the same material meant for exercise flooring. Also, 9 pieces...really? Not 10 - that would make an actual rectangle that was useful - but 9. Ugh! If there were enough squares in the package to cover the space to block all pieces of a sweater I would give it an excellent rating even at the steep price, because I like tools that work and make my life easier, and I'm willing to pay for them. But this feels like I am being ripped off and treated like an idiot, because I would have to buy 2 sets. I'm not doing that. Also, I bought this set at a LYS (01/07/2018) and when I took them out of the sealed Knitpicks box they were all covered with a layer of very fine glitter. Annoying. I had to clean the glitter off, more than one round of washing and rinsing, before I could use them. Love my blocking sqs used towels for a long time finally had enough of that, things dry very quickly on the blocks I place them on my large dining table beneath a ceiling fan. Am ordering another set today hope they mesh together other reviews have said they do not but I am willing to try any how. Found a plastic craft box at Michaels that holds the whole set perfectly. Love all of the products I have bought from Knit Picks.